We understand that learning disabilities are caused because of the way the brain works -- but by learning the complexities of it, we can actually learn how to retrain it to learn differently. The right brain hemisphere is the creative side, which is responsible for much of our visual processes and actions, including sorting colors, pictures, shapes, music, and daydreaming. It also manages movement, problem solving, and even emotion. For right brain dominant children, they learn best "from whole to part." The left brain hemisphere, conversely, is responsible for more direct and scientific processes, like words, phonics, reasoning, math, lists, and analysis. Because it's so connected with linear thought, left brain dominant people learn best "from part to whole." Most of what schools expect students to become proficient in is processed on the left side of the brain. Yet, it's obvious that we need both sides of the brain to work together in harmony for learning and a balanced life. For example, a person needs to be constantly accessing both hemispheres of the brain simultaneously even when doing something as simple as reading. If a students' processes are “stuck” in one side of the brain, then reading becomes difficult. 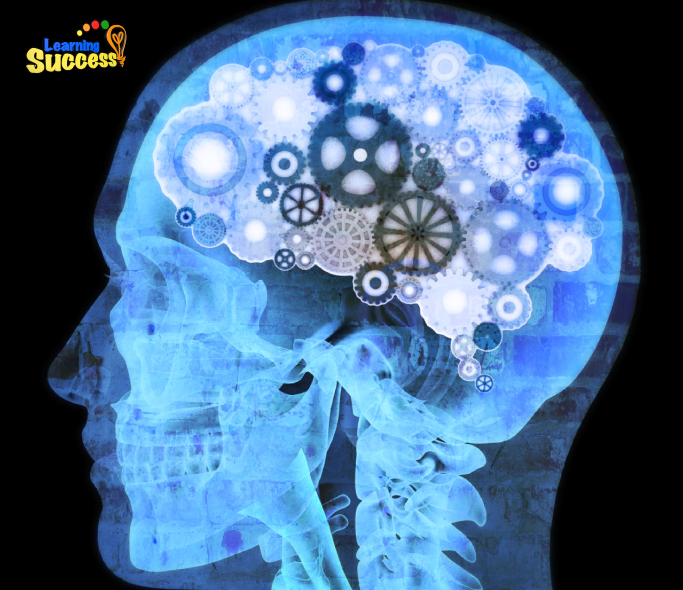 Why do learning disabilities develop, and is there any way to retrain your brain to help them? In the middle of these two hemispheres is a bundle of nerve fibers. This bundle, called the corpus callosum, is a network of circuitry allowing the left and right hemispheres to communicate -- but when someone has a disability, it often becomes more of a wall. If someone has dyslexia, for example, visual information taken in bounces off of the wall and comes out differently, perhaps backwards or upside down. Some people similarly recieve auditory information that bounces off the wall and gets lost. In that case, they have a difficult time concentrating, holding on to what is heard, and tuning out extraneous information. These students can’t always comprehend directions in auditory memory, either, and may only hear bits and pieces of words and sentences. This also causes issues with isolation, since people build relationships through verbal communication. A person needs to be constantly accessing both hemispheres of the brain simultaneously even when doing something as simple as reading. When babies are born, the corpus callosum isn’t already integrated. Physical movement wires the brain to do simple tasks, even ones as mundane as sucking a thumb. As babies grow, the act of crawling activates the visual memory center, using both sides of the brain simultaneously. From there, both sides learn to work together. All of this sets the stage for later learning. But if the baby misses the activation of one of an area, then a learning problem can occur later on. The upside is that this means physical exercises involving the eyes could potentially rewire the brain for learning success. One such excercise has a child look in a certain direction while doing exercises that simulate a baby crawling. While there needs to be other components to make effective changes, these techniques can still be useful in helping students change for the better, both academically and emotionally. The brain is separated into the right and left hemispheres, which control different aspects of life. 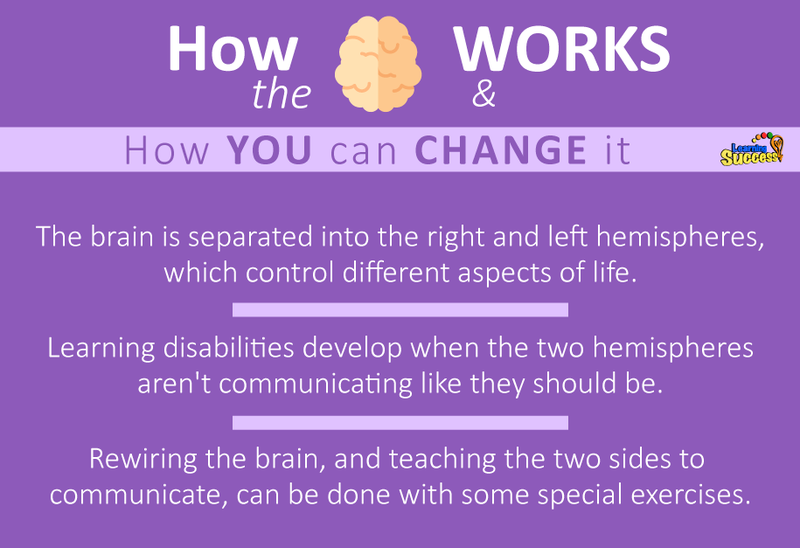 Learning disabilities develop when the two hemispheres aren't communicating like they should be. Rewiring the brain, and teaching the two sides to communicate, can be done with some special exercises. Through simple physical and mental exercises like this, children can get back and track, and potentially even retrain their brains to start learning better.